A simple tutorial helps you learn how to draw a doughnut chart. Gain editable doughnut charts in Word, Excel and PowerPoint format via 1 single program. Increase you understanding of charts and work more effectively with our Doughnut Chart Software. 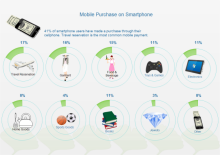 Starting from interactive template is the fastest way to create doughnut chart. Doughnut charts are excellent for displaying data points as a percentage of the whole. 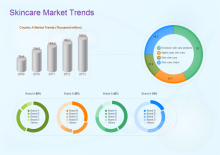 Edraw offers many doughnut chart templates in vector format. 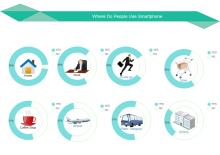 You can create the following types of doughnut chart easily in minutes. Simple Doughnut Suitable for comparing different categories. Suitable for showing each item's contribution rate to the whole. Select a doughnut chart shape and move a segment to new position to make an explored doughnut chart. Unique doughnut chart with more striking appearance. Open the Pie and Doughnut Template from the Chart library. Drag the shape from library to start your doughnut charts. The smart shape supports point-and-click editing. This easy editor has automated many steps in the charting process, making it much easier. Move the cursor over the shape and then a floating button will show. Rest the cursor over it to show the menu. Choose corresponding option to edit the shape. Except for Doughnut with Handle, you can edit the percentage value to change the shape. It means that, right after you enter a new number, the shape changes the corresponding segment automatically. As for Doughnut with Handle, you cannot edit the percentage value to change the shape. 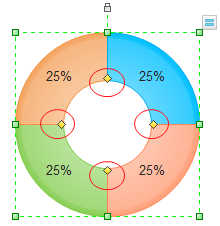 Select the doughnut chart, drag the yellow diamond handle to change the segment and percentage value. Select a category sub shape; change its fill style, then the new fill style will be applied to legend. 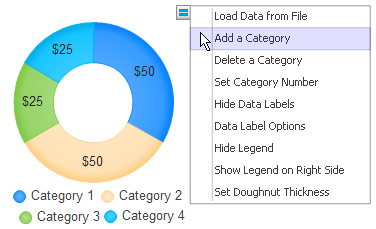 Click Set Doughnut Thickness on chart action menu, the thickness value is from 10% to 100% of the doughnut. When you complete the doughnut chart in Edraw, you can export it to MS Word, Excel or PowerPoint with one click. 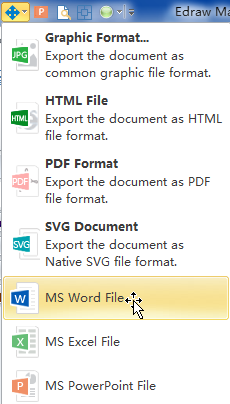 The exported file remains editable. In just 1 single program, you can gain doughnuts in word, Excel as well as PowerPoint format. Hit on the Export button on the Quick Access toolbar, choose a format you need. See the illustration below. You can also save it as the project file for revision later. Alternatively, print it or export it as the html, pdf, svg, transparent png format.